I still had that prayer in my heart when I arrived in Covina to meet my sister, nephew, and brother-in-law. It was my sister’s birthday. She arrived at the train station in a demure black sweater with a purple flower climbing the shoulder, and a luxurious flouncing purple petticoat. Both she and my nephew wore party hats pushed to their foreheads like unicorn horns, (as unicorns are my sister’s totem of choice). We all hugged hello saying, “Birthday sparkles! Yay!” I even hugged my sister, which may be the first time I have ever done that, including when we were children. It was a good thing to hug her in that moment, because we were in the moment, and the awkwardness dissolved in the unicorn/birthday/petticoat sparkles. 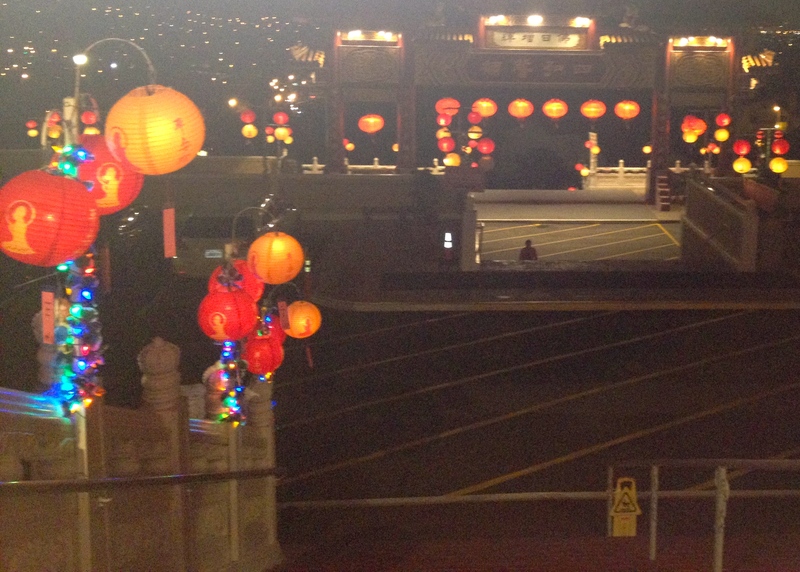 On our way home, my brother-in-law decided to drive by the Hsi Lai Buddhist temple to show me how it was all decked out for Chinese New Year. I saw red lanterns peeking over the top of the hill, quietly. They had their own work to do—their own secrets to tell. Looking down into the valley from atop the marble stairs at the Hsi Lai Buddhist Temple. We drove up the hill and those few teasing lights multiplied into a galaxy of red and orange and yellow, clustered in constellations around every column, every newel post, every everything that would stand still long enough for them to float around and upon. We thought the temple might be sleeping, but it was instead blazing with light, life, and activity. We parked the car, having at one point to make a U-ey in the parking lot of the monks’ house, and proceeded to cross under the glowing red gate and up the marble stairs still slippery from an early evening rain. Looking inside Hsi Lai Buddhist Temple. When we stepped inside we were greeted by a wall of light in bright white striations on tan marble. The light was broken in nooks for five shining Buddhas, all in gold, white, and blue. We had to crane our necks to see their serene faces. Before we entered the temple, my sister told my nephew to keep his voice to whispers. Seeing those Buddhas, the admonition was unnecessary for all of us. The whispers of awe came naturally. I saw, in the middle of the room, a wooden box on a post for donations. All I had in my pocket were the two quarters I had left over from the two packs of Djarum Black cigarettes I had purchased between the train station and the temple. Normally, I save all my change to put in my Owl-y for Athena (read: make an offering), but as I approached the donation box, I saw her open her hands and knew she would graciously give her coins to the Buddhist monks. I have to admit this was unexpected. As Hellenists, we are so often taught, or rather it is a cultural understanding, or misunderstanding, that our gods are jealous and stingy with their offerings, that their vanity extends to the point of whammy-worthy retaliation should we do something with their offerings other than lay them at their rarified feet. This was not my experience. Athena graciously gave of her offerings. The feeling I had was one of expansive respect for another beautiful, powerful religion and those who would devote their lives to the service of it. It would seem unimaginable to take an offering from her temple to lay it down in another, but I not only felt it was right, I felt she decreed it. Here is a place, so close to her own spirit, also dedicated to learning and culture. My small donation couldn’t possibly be better spent. Chinese New Year courtyard centerpiece at the Hsi Lai Buddhist Temple. Before this realization settled in fully, and before I could settle my quarters into the donation box, I noticed my family had wandered off to the left, down some mysterious hallway, and I was quick to follow. “You have to see this,” my brother-in-law said. He had been down the hallway before us. We creeped along behind him. It was the kind of barren church hallway you would expect to see in any church—the kind that gets permeated with potluck steam and the perfume of church ladies. I expected to see something small, some gathering, some tiny, holy thing that maybe we weren’t supposed to see. We took a twist and turn and another twist and another turn and finally the hallway opened up to a glorious courtyard blazing with light. People milled around at tables at the end of the courtyard where we were standing. 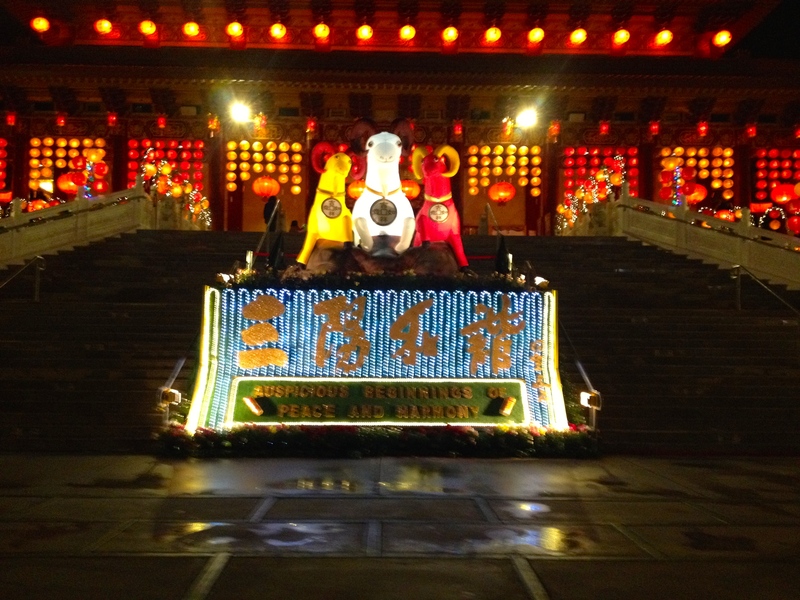 At the far end, great panels of red and orange lanterns loomed over a ram, a goat, and a sheep, standing side by side over a giant blue and gold sign announcing the new year. 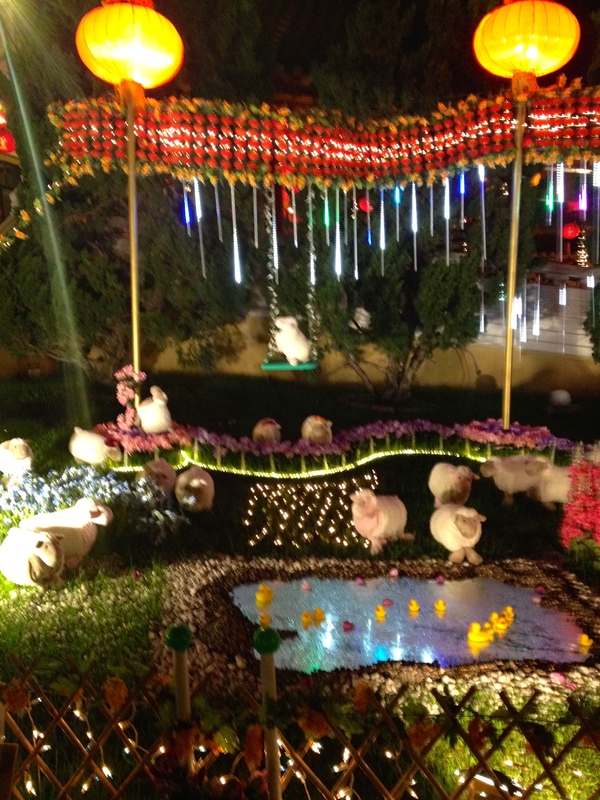 All around the edges of the massive courtyard were dioramas with happy sheep celebrating the new year, Buddhism, compassion, peace, and harmony among all religions. 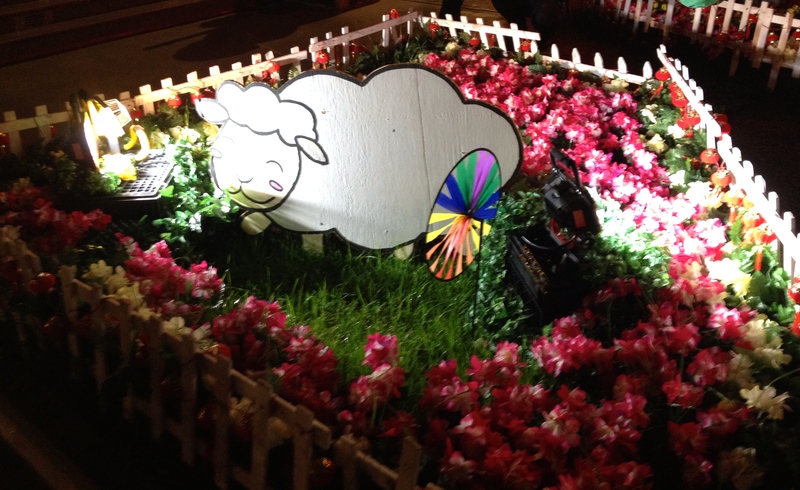 One of the MANY smiling sheep celebrating Chinese New Year at the Hsi Lai Buddhist Temple. I am not exaggerating when I say there were sheepies everywhere! Little smiling sheep with rainbow wheels. Little smiling sheep with flowers. Little smiling sheep at play with other little smiling sheep. One little smiling sheep was even sitting on a swing amongst his smiling sheep brethren. It may seem silly, but all those sheepies brought a warmth to the heart that evoked the peace and compassion around which the dioramas were designed. Who can resist the sheep? You can’t. They overwhelm you. It’s impossible. Resistance is ewe-sless (see what I did there?). 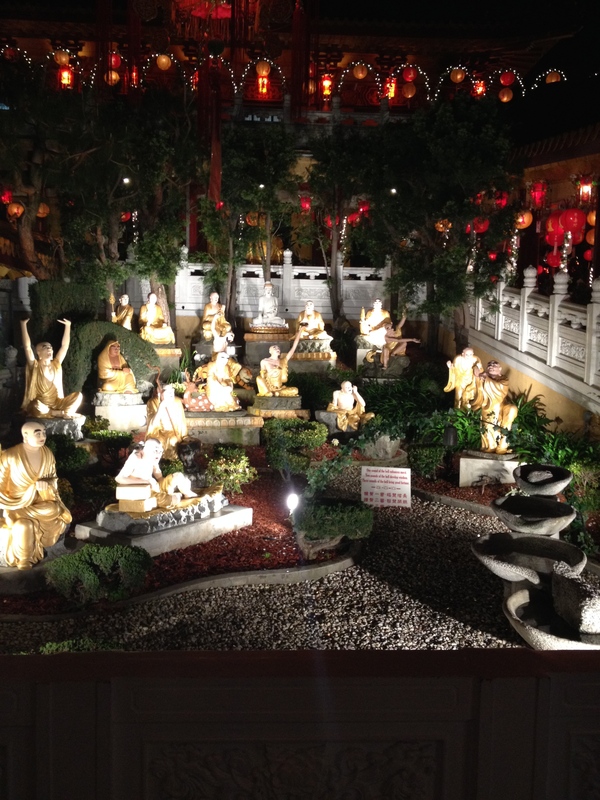 Leaving the immediate courtyard, my sister, brother-in-law, nephew and I found a Buddha garden. My brother-in-low insisted there was a bell somewhere in the garden that you were supposed to throw a coin and hit so as to receive blessings. My eyesight is so poor, I had to take his word for it. I gave my nephew one of my two Athena coins and he made the toss. No bell rang, (giving me suspicion this bell might be imaginary after all). I’m sure blessings ensued regardless of aim or reality of said bell. Along this same corridor, another Buddha garden, but this one with a fountain. The fountain I could see, so my nephew graciously let me toss my last Athena coin in. As I did, I asked her to bless the temple and all who worshipped there that it may stay beautiful and thriving. I know she will pour these blessings out freely. We noticed people walking around with round, multi-colored lanterns and, (because this is what kids are good for), we asked my nephew to go find out how to procure one. He went over, worked his charms, and got an orange one just for the asking. Thinking there might be more lanterns to be had, the rest of my fandamily and I moseyed on over where the lanterns were strung. A happy lady dressed in an orange vest, belonging to the temple in some way, I assume, popped out from under the lanterns and asked if I would like one. I said yes, but then she told me I had to answer a riddle first. (Pause here to meditate on how AWFUL I am at riddles). Very blurry swinging sheep at the Hsi Lai Buddhist Temple celebrating Chinese New Year. The answer? Why, “sheep” of course! And I actually got that one, if you can believe it! (My sister guessed a bear—she didn’t say the animal gave up its coat AND its life. I’ll give her some slack though. I thought bear too at first, then I looked around and… wait a minute…). Our lady quizmaster pulled a red blessing tag off the lantern and handed me one of a beautiful blue to match my coat. My sister, feeling it might be bad form to ask for another right off the bat, wandered back toward the swinging sheep. While loitering there, my brother-in-law came over to ask for help with his lantern riddle. All I can say is I’m glad it was him and not me, because “sheep” was only going to get me hooked up once. And finally, “It’s related to a telescope!” (with hand gestures). “Kaleidoscope!” we burst out at the same time, (though, in all seriousness, I was a second faster). Such a relief and a pretty purple lantern for him to give to my sister for her birthday. 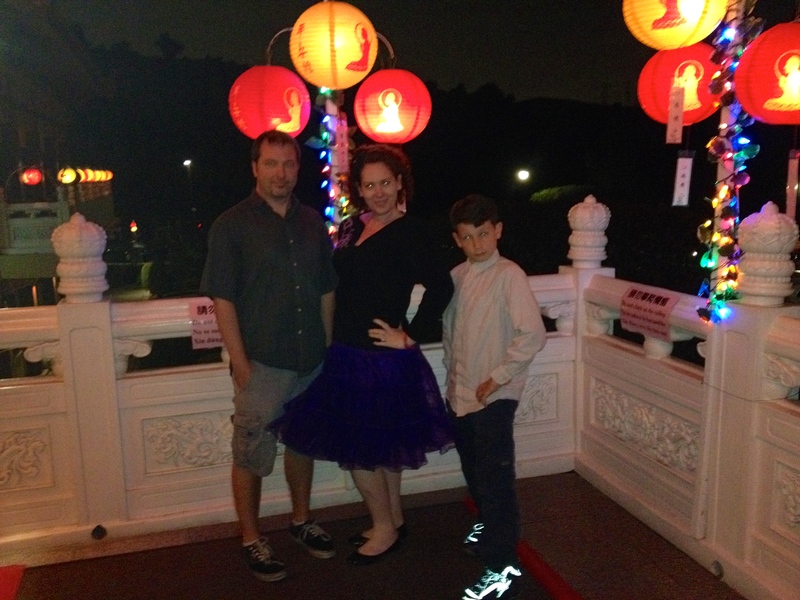 The red tags she took from the lanterns were blessings for us to be added to the blessings basket. I can’t imagine any blessing greater than simply being there that night to witness and to participate in that glow. It stayed with me for days and stays with me still. Great blessings from my own gods to have been able to visit and play in the sacred space. The longing I felt from the train had been answered in full. 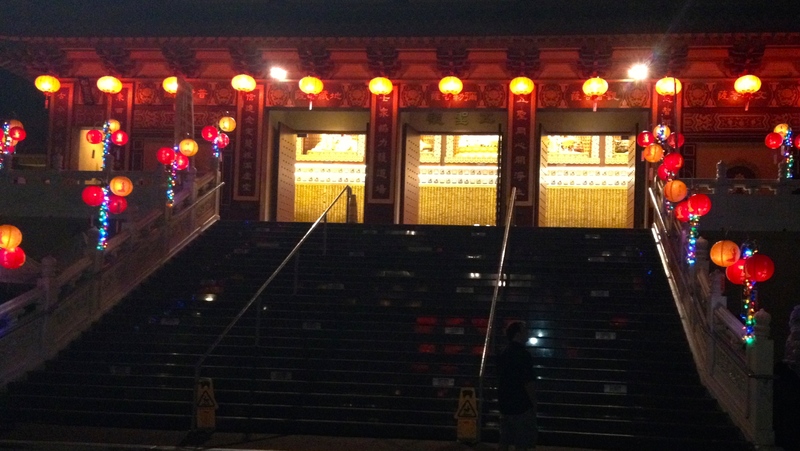 This entry was posted in Family, MysticLife, World Religions and tagged Buddha, Buddhism, Chinese New Year, Hsi Lai Temple. Bookmark the permalink.